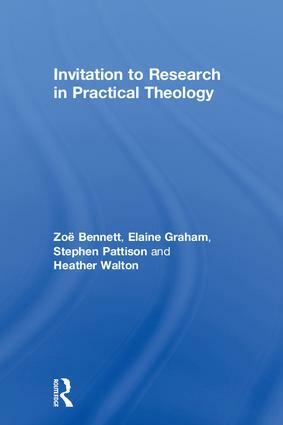 Zoë Bennett is Director of Postgraduate Studies in Pastoral Theology for Anglia Ruskin University and the Cambridge Theological Federation. Elaine Graham is Grosvenor Research Professor of Practical Theology at the University of Chester and Programme Leader of the Doctor of Professional Studies in Practical Theology. Stephen Pattison is Professor of Religion, Ethics and Practice and H.G. Wood Professor of Theology at the University of Birmingham. He is director of the Doctor of Practical Theology programme at the University. Heather Walton is Professor of Theology and Creative Practice in the School of Critical Studies, University of Glasgow and Director of its Professional Doctorate in Practical Theology.